I came across Ejaaz couture Instagram page and I contacted them on whatsapp. I got my wedding outfits done from them and got so many compliments. I was beyond satisfied with the fittings and quality. Thank you so much Ejaaz couture for taking care of my outfits. I had a fabulous experience with the team of Ejaaz Couture. To begin with, they have very well thought out process right from ordering to delivery made to customize as per the taste and requirements of the customer. The team worked effortlessly with me to understand my requirement which made the ordering really easy. In the end the outfit was perfect, personalized to my taste and it was value for my money. I can't wait for the next occasion on which i can order another outfit from them! Good experience.you wil definetly get your stuff with good quality. Ordered my wedding sherwani and my fiancee's outfits from Ejaaz and extremely happy and satisfied with their service and products. Received alot of compliments and would recommend everyone who is looking for wedding shopping to consider Ejaaz for sure. Got my bridal outfits and my family outfits for my wedding and i was more than satisfied with everything. From talking about the ideas of my bridal outfit to modifying designs as i was a hyper bridezilla, Mukul really understood my taste and my vision. he made us feel so comfortable and trusted, that we knew that we are at the right place. I highly recommend Ejaaz couture for all the brides to be. Its a one stop shop for your designer wear needs. Worst service ever.if you guys want your stuff on time without any headache please donÃ¢ÂÂt ÃÂÃÂorder with Ejaaz couture. I ordered my dress with them and they were replying really fast and quick so i decided to get dress from them.i talked to mukul and he told me i ll get my dress ready within 4 weeks so i was really excited.but it was about 3 weeks when i start texting them as I havenÃÂ¢ÃÂÃÂt heard anything back from them about showing swatches.i was getting only one reply you will get dress on time.i havenÃÂ¢ÃÂÃÂt got my dress in 4 weeks.but as i ordered in little advance so I thought its ok i still have some time.i was texting them and only reply i was getting was u will get it on time.so as I was suppose to get my dress before 28 February .i got my dress on 25 march when I already missed the occasion.after 100 text messages Someone from their team contact me on 19 march that my dress is ready and i have to send money to them right away.so i told them i need some time i mean i was in different country to attend wedding so i had to send someone to transfer money.so next day they said they already sent the dress and i sent them the money but when i asked them about tracking number they gave me invalid tracking number And actually sent me dress on 21 march and i got it on 25 March but my occasion was on 22 march After all this they were blaming me that i was late 14 hours for payment.are you guys kidding me you guys were late 3 weeks and i had to get another dress . I donÃÂ¢ÃÂÃÂt even want to start about quality of the dress .my zipper of dress got broken even when i was trying the dress and the picture i sent them is completely different from dress i got. 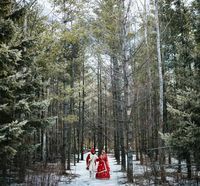 By far the best experience throughout our wedding. Mukal shared our outfit details with us very step of the way. He paid attention to very single detail for all the handmade pieces (sangeet outfit bridal /grooms sherwani shoes). We were so glad we found such an amazing vendor and team to design our dream outfits. Our outfits our shoes everything was handmade with love. Honoured to be #ejaazcouple ! You have a forever client in me. Thank you Reenu for being one of our loveliest brides ever. We loved designing for both of you ???? Ejaaz Coutoure did a great job with my pageant lehenga! It looked royal and very intricate! I had a demand of needing a very complex lehenga in just one months time and they made it look great and delivered it to me. I loved working with ejaaz and 10/10 recommend! Ejaaz Corture is the best! My bridal and reception outfits turned out just perfect. Everyone loved them. Mukul is amazing to work with. I will definitely order more outfits in future! I ordered a lehenga for me and my niece on my wedding. we wanted it to look the same. This team helped us make our vision come true. I had very short time in hand and I was planning a wedding from overseas.. but my lehenga had the perfect fitting and color as I imagined. Thank you, Mukul and Misha! Thank you Shannon.. it means alot coming from you !! We are a big fan of Pink Orchid Studio and your work ❤️ so excited to see you wearing our creation !! Ordered an outfit the last minute. It was delivered in a timely manner and the outfit was beautiful. Thank you for your great service and I will be ordering soon! Ejaaz helped me design my wedding reception outfit. I gave them a picture of what i wanted snd the changes i wanted for that including the colour. They sent a sample and started designing my outfit straight away. I was amazed by the finish product. It was perfect ! Received just on time. And i am incredibly happy with it. I will definately be ordering more from you in the future. I will send you photos once i receive them :) thank you ! Thank you Rosie!! Looking forward to designing for you in future too ???? After contemplating and speaking to various designers in India I came across Ejaaz Couture on Instagram and absolutely loved their work and decided to go with them in order to get my Sangeet outfit made. Mukul was great in communicating and suggesting the ideas would work better for my outfit. I absolutely loved my Sangeet outfit and pleased to say that now I have Ejaaz couture and will be getting all my future outfits done. All you need is a picture of the outfit you want and Mukul and his team will make it a reality for you. Very pleased customer. Beautiful work! Prompt responses on whatsapp! And most importantly, my dress was delivered exactly on time. Will definitely purchase more outfits from them in the future! Mukul did an amazing job on my wedding outfit. He made my outfit in 20 days. I just gave him the picture and we discussed everything over the phone. The outfit was exactly the same as the picture. I could not have asked for more. Customer service was great. He listened to all my concerns and gave his opinion as well. I am really glad i chose ejaaz couture. Ejaaz Couture did a great job with my bridal outfit. 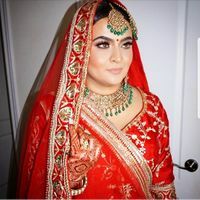 Found this vendor on Instagram and was initially very nervous to order a bridal outfit through WhatsApp & wire money over to India but my outfit turned out great and came within two days of shipping - all the way from New Delhi to New York City. I ordered an outfit that the team had created once before and only had a timeline of about 3-4 weeks. They were able to recreate the outfit and ship me my dress within a very short time frame. Mukul was very responsive through WhatsApp and answered messages/took calls during off hours as well. Will definitely be using them again for my future events. If you are interested in using this vendor and have hesitations with the process like myself, rest assured they are a legitimate team and work very hard to deliver your product!! My dress turned out beautiful. Thank you Ukarjit!! You are an absolute darling ❤️❤️❤️ You nailed all the looks for different events !! We are lucky to have been able to design for u ???? Mukul and team did a tremendous job at making my lehengas and my husbands sherwani, he paid a lot of attention to details and always suggested ideas. Everyone loved the outfits we received numerous compliments. All in all i would definitely recommend him to everyone. He made my reception outfit in just one and half month. I was in Canada. Everyone loved my outfit and Mukul makes sure he makes his clients happy with any last minute alterations the client may request! My husband’s sherwani was done by him and all loved our outfits!! Great label!! My dream wedding outfit was made by Ejazzcouture. I was on a tight budget and timeline. I found Ejazzcouture on Instagram and am so thankful I did. Initially, I was nervous about sending money via wire to someone I had never met! I live in the US, and EJAZZCOUTURE ensured that I would get what I pictured. We spoke a few times, and once the owner asked to give 24 hours for a response time, I was happy. I wanted instant responses because I was so anxious! I had to remember this is a boutique and they are working hard! My sister and I are both excited we have found an amazing designer and are already saving outfit ideas for our next Ejazzcouture pieces. The material was perfect! (They ensured there was fabric left on the inside). I have very wide shoulders and though the fit was perfect, I wanted more room. My tailor here in the US who made the modification was VERY IMPRESSED by the work and said they ensured you could make minor modifications for fit with no issues! I got a heavy design and it was exactly like the picture/design provided. I will only use Ejazzcouture for any future outfits. Thank you so much Harshmir! It was our pleasure to work with you... Sending you lots of love ???? The Ejaaz Team was absolutely amazing to work with while I planned my outfit for my wedding reception. During my planning I had ordered from another company, however the product I got did not match my vision. 1.5 months to my wedding, I came to Ejaaz, and asked an impossible task - I asked them to make me the perfect dress, in a limited time. Without hesitation they told me they could do it. They worked closely with me to create the perfect colour, style, embroidery and fit. My dress turned out better than I could have asked, and all my guests thought it was stunning! I am so happy I worked with Ejaaz. They helped me create my dream dress! Thank you Rena for considering us to design for you for your big day !! Means alot ???? Ejaaz Couture spent a lot of time understanding my needs for the dress and put a lot of effort in to create it perfectly. Ejaaz Couture was a pleasure to work with. They were very responsive through both instagram and whatsapp. I showed them the vision I had for my outfit and they made the vision come to life. They stayed in touch with me throughout the whole process and even showed me a swatch of the embroidery and updated me on the progress of my outfit. The outfit was made within the time frame that I requested and was delivered to Toronto, Canada on time. The quality of the outfit was superb as well. They used the best fabrics and the hand embroidery is very unique and special. I will definitely be ordering from them again for all of my other events! I am very impressed with their service. I am from London, UK and I found Ejaaz Couture on Instagram. I contacted them via whatsapp and received a response immediately. The designer was brilliant, so professional and willing to listen to all of my ideas to create the perfect outfit, I was so surprised at this brilliant service. I was able to communicate with them throughout the making of my entire outfit so I never had any doubts about what it would look like or the product I would be receiving. I received the product at the exact time I wanted to receive it... and the outfit itself... absolutely perfect. The level of detail and effort that had gone into the outfit was OUTSTANDING, it was perfection. I received so many compliments on the outfit and people asking me where I got it from as they wanted one too! Would thoroughly recommend if you want the dream service and dream outfit. Thank you Ejaaz, I am definitely staying loyal to you! I bought my dream lehenga from Ejaaz couture. I came across their Instagram page and i contacted them on whats app. The designer really made it very easy and comfortable for me to place the order and get my ideas converted into an outfit. They couriered the lehenga and other outfits to me and i was beyond satisfied with the fittings and quality. Got so many compliments!! Thank you Ejaaz for taking care of my outfits with so much love and hard work!! I will recommend always... worth every penny. Thank You Mallika!! It has been a wonderful experience to design for you... ???? I found E?jaaz couture on Instagram and it has been a delight since then. I feel they are the Mavericks of making inspired designs with highest quality and craftsmanship . I got my wedding outfits done from them and I get compliments till today. From samples of fabrics and embroidery being mailed to me for approval, to fit of the outfit, everything was just superb. E?jaaz Couture is my and my family?s and friends Designers for Life now !! Thank you Sunita for being one of our sweetest and kindest clients ???????????? First time I ordered with Ejaaz couture they were awesome and my outfit was delivered within a week.I will be ordering more outfits with them. Horrible experience! Ejaaz couture has proven to be unreliable as none of the outfits I ordered arrived on time. My order arrived three months late and outfits were such a waste because they didn't arrive on time and you could tell they were such a rush job. On top of that, they denied receiving my e-transfer, not a good feeling when you are ordering outfits from overseas. There are tons of other vendors that value their business and will deliver on time. The excuse received was that they have so much work from their regular boutique clientele that my orders were not given priority. Messages and calls weren't answered. Why take a deposit when you can not commit to delivering the outfits on time? Lastly, they posted my outfits on their IG page so they take credit for my outfit designs and can recreate the same outfit for anyone else, not very exclusive. Thanks Mukul for my stunning outfit.... it’s absolutely gorgeous!! Amazing quality and design! The outfit arrived in perfect condition and fits me perfectly. Everyone absolutely loved my outfit here in Sydney. I can’t wait to try on my cocktail gown - for my India cocktail party. Will definitely recommend Ejaaz Couture to any overseas or Indian clients who are looking for good quality stuff within affordable price range. Keep up good work ???? Thank You Divya... you made our outfits look gorgeous !! One of Ejaaz’s most gorgeous bride !! I came across Ejaaz Couture on Instagram. All I had to do was send them a reference picture of the lehenga I wanted for my wedding and thet delivered exactly that and much more. The lehenga was absolutely beautiful and exceeded my expectations. Thank you so much once again. Wedding is the most special day of anyone's life and so for the bride's and groom's family.. It was my brother's wedding and I scrolled the ejaaz's page of instagram and thought of going with the same.. The order was delivered to me well in time and the outfit turned out to be really beautiful.. The flooded compliments i got about the outfit and it suiting me perfectly made me feel more satisfied..!! Surely ejaaz couture lived upto my expectations.. Looking forward to have my own wedding dresses by them and suggest to all closed ones.. to add on they dont make u feel as a customer but as a family by giving personal attention to every details u need.. It was not just buying.. It was an experience! ? I found Ejaaz Couture on instagram and since then it has just been an awesome experience and more... i dealt with Mukul himself and he gave me exactly what i had envisioned.. right from my bridal lehenga to my trousseau outfits, he helped me create all of them with so much finesse and novelty that i was overloaded with compliments.. I highly recommend Mukul and his team Ejaaz to every bride out there who is looking for custom made outfits be it indian or western ? I am from Vancouver B.C. and when I traveled to Delhi to pick up my wedding lengha, Ejaaz Couture had it ready to go! Despite the short notice I gave for designing my outfit, they brought my dream outfit to life! It was the best decision to go with Ejaaz, as it made the rest of my shopping trip in India so much easier and less stressful! The workmanship was top notch and I cannot wait to wear my wedding outfit next month! I found Ejaaz Couture on social media, specifically instagram as I was searching for inspirations for my wedding outfits. I'm a full time student and with all the stress planning a wedding was giving me, my finals topped it all off, however I had nothing to worry about as Ejaaz Couture took care of both of my outfits for my wedding! I went with ideas to him and he made my desired outfits come to life! From the fabric to the designs it completely a designer piece. I had received numerous compliments from friends and family and I truly advice all brides to be to check out Ejaaz Couture for their dream lehngas. I look forward to get more outfits made by Ejaaz in the near future. ?? I've finally had the chance to order my pieces from Ejaaz Couture! I must say their work is amazing and one of a kind. I'm from Vancouver, and I received my pieces and when I did I was blown away on the quality put into each outfit. Ejaaz Couture is a place that can help bring your wedding or any occasion outfit come true! I would like to add that I think calling Ejaaz a scam is far far from them. They care about each client. Ejaaz Couture Thank you soooo much for making my pieces! I will definitely recommend you to friends & family!!!!!! Thank you so much Neha! It was a pleasure working for you and dolling you up! I had a great experience from Ejaaz Couture . I found him online on instagram and decided to get my lengha designed by him. At first I as worried as I live in Canada and heard about many Internet scams but he made me feel so comfortable. I got my outfit on time and it was absolutely stunning. I got so many compliments on my outfit. He's definately my go to guy for any outfits! Simi! We had most fun and frolic creating your dream outfit! Looking forward to working on your future outfits ? ?